What car should I ship to the Congo? Jalopnik reader Wes has a request. He's taking a job with the US State Department and must ship a car to his new post in Brazzaville. Tough and cheap are the key words. What car should he ship to the Congo? I need to buy a car soonish to ship so that I can use it in the country. I'll be using it everyday for 2 years. I need something that is reliable, as the garages in Brazzaville are expensive and not so great. Of course, I'll ship some spare parts with it but I really need something that can survive those 2 years. I have to get a 4x4 with high clearance, as there is frequent flooding. I also need to be sure it can handle some horrible roads and go off road for some adventure. I'll need to remove the catalytic converter from what I hear, as there is only leaded gas in Congo. Of course I would like manual transmission. At the end of the 2 years, I don't know if I will keep the car or leave it in Congo - so I don't want to dump a ton of money in this if I don't have to. I would prefer something in the $5,000 to $10,000 range - but I could go up if I have to. It is recommended to get a Toyota, as that is the one type of car they sell in Congo. Most other Americans there have Toyota RAV 4's. However, huge SUVs don't appeal so much to me. I don't have a spouse or kids, and I'd really like something more like a Jeep Wrangler or maybe a Land Rover Discovery or Toyota 4Runner or something. Most Congolese have a Toyota Hilux. Anyhow, I really don't know where to start looking or what I should be expecting. I'm also really afraid I'll make the wrong choice and the car won't be able to handle Congo. 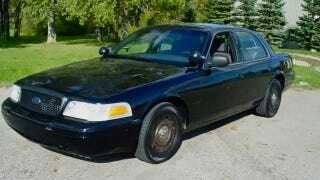 We think this is a job for — Police Auction Crown Vic! Just add a light donk lift and off-road tires, and you're set. No SUV nonsense for this guy. Anyone can work on it, parts are cheap (you can ship a whole replacement drivetrain if you want) it's nearly bulletproof and what else screams State Department like a utility-spec Vicky? I'm sold. What say the rest of you?